Refuting the argument to choose between "the politics of recognition" and the "politics of redistribution," Justice Interruptus integrates the best aspects of both. ********************************************************* ** What does it mean to think critically about politics at a time when inequality is increasing worldwide, when struggles for the recognition of difference are eclipsing struggles for social equality, and when we lack any credible vision of an alternative to the present order? Philosopher Nancy Fraser claims that the key is to overcome the false oppositions of "postsocialist" commonsense. Refuting the view that we must choose between "the politics of recognition" and the "politics of redistribution," Fraser argues for an integrative approach that encompasses the best aspects of both. 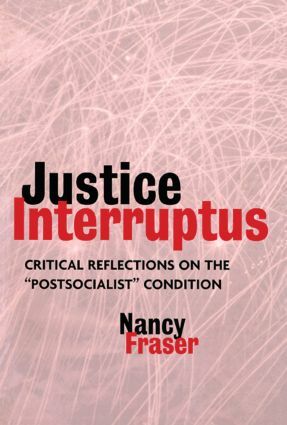 Nancy Fraser is Professor of Political Science in the Graduate Faculty of the New School for Social Research. She is the author of Unruly Practices: Power, Discourse and Gender in Contemporary Social Theory (1989), the co-author of Feminist Contentions: A Philosophical Exchange (Routledge, 1994), and the co-editor of Revaluing French Feminism: Critical Essays on Difference, Agency, and Culture (1992).